Mercedes-Benz Bionic car: Boxfish stability and agility paradox finally solved. Mercedes-Benz modeled a car on the boxfish. 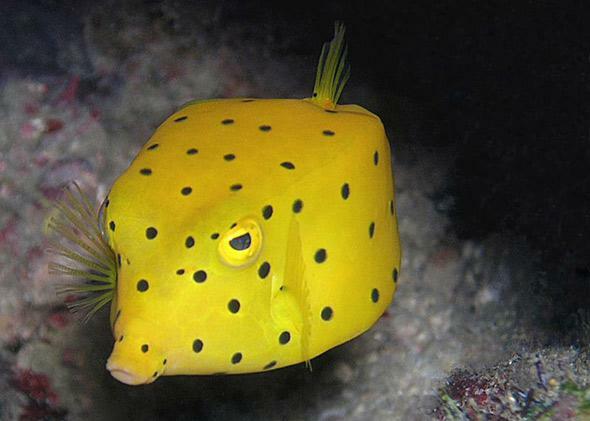 Only it completely misunderstood the boxfish. In the mid-1990s, Mercedes-Benz wanted to design a car. But not just any car, and through not just any design approach. Mercedes-Benz sought to design a vehicle that was at once aerodynamic, safe, efficient, and maneuverable, and to achieve all of these goals while drawing from a single, overarching theme, Mercedes-Benz turned its gaze to nature for inspiration. After much searching, the company looked to the boxfish, a small, tropical coral reef fish, as a model. Unlike just about every other finned fauna on Earth, boxfish are entirely encapsulated in a squarish or triangular, lightweight, rigid, bony shell (called a carapace) derived entirely from numerous smaller, stony plates fused together, looking like a honeycomb that locked eyes with Medusa. Engineers specifically took interest in the boxfish’s carapace and its shape, which were thought to have impressive hydrodynamic characteristics. The boxfish body, despite being a blocky, broad, rounded shape (conveniently similar to that of an automobile), was reported to have exceptionally low drag. Additionally, the carapace supposedly had unique, inherent, self-correcting stabilization properties, directing the flow of water in such a way that the swimming fish is kept on course even in roiling waves. This miraculous combination of a spacious body, low drag, and high stability meant that the boxfish was an A-1 choice as a model, and the design team set to work, adopting the boxfish’s unusual shape when crafting the contours of the new vehicle. 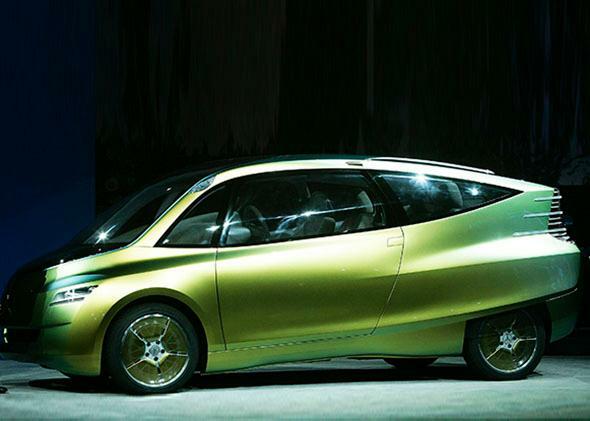 In 2005, Mercedes-Benz unveiled the Bionic, the concept car that resulted from this boxfish-inspired endeavor. The sleek vehicle’s debut received substantial attention. Seriously. People were talking about this car. Even several years on. Mercedes-Benz’s strange “fish car” was touted as a groundbreaking application of the concept of “bionics,” in which technology is directly informed by and modeled after the biological world. The Bionic was widely interpreted as a symbol of the power of collaboration among biology, engineering, and design, and an example of the utility of drawing directly from the pool of inventions already shaped by millions of years of evolution. A Mercedes-Benz Bionic concept car in 2005. However, Mercedes-Benz may have completely misunderstood the boxfish. According to a new paper in Journal of the Royal Society Interface, the company misinterpreted the fundamental hydrodynamic profile of this fish, and by logical extension, the Bionic concept car as well. The authors, researchers at the University of Antwerp in Belgium, the University of Groningen in the Netherlands, and UCLA, contend that the boxfish body shape does not particularly excel at drag reduction. * Not only that, but it actually promotes instability while swimming, rather than minimizing it. This contradicts the entire premise behind Mercedes-Benz’s bionics-driven concept car. The researchers showed the misstep by successfully solving the “boxfish swimming paradox.” The paradox sits at the conflict between the supposed flow patterns influenced by the boxfish’s body shape and the day-to-day needs of a fish living in a coral reef system. The shape of the body, molded by the bony carapace, was thought to function as a built-in stabilizer. If you are a boxfish, and you get pushed so that you pitch upward at a sharp angle, it is thought that vortices tightly twirling around the keels projecting out of the outer edges of the carapace will usher you back onto your original path. And if you get pushed from the side? A separate vortex is summoned along your boxy figure, and after realignment, all is well. This is what is known as “vortex lift,” the same mechanism responsible for stabilizing the insanely dynamic flight of delta wing aircraft, allowing for a vast increase to the aircraft’s angle of attack without causing spectacular, in-flight obliteration. However, this mechanism becomes a problem if you ever want to make a turn of your own volition. Ever. At all. Turning is, by definition, a deviation from a forward course—precisely the action that is supposed to be nullified by the hydrodynamic characteristics of your lovely, quadrate bod. Theoretically, if the course stabilization mechanism is good enough, you become a train bound to its tracks, trapped along a linear path, where deviation from this requires the input of large amounts of energy. This isn’t a realistic way to live for any animal, let alone any fish, given its three-dimensional environment. It’s especially unbelievable when you consider the ecological and behavioral reality of boxfish. Boxfish manage to turn around in the wilds of their coral reef homes. They do it frequently, and they do it really, really well. Boxfish spend their days flitting about in complex reef habitats, full of narrow crevices and pockets between branches of coral, necessitating a high degree of maneuverability. A boxfish turns on a dime at the first sign of a threat and barrels expertly into the coral cover of the reef. This discrepancy between what we see in nature and what we see in the fluid dynamics data is at the heart of this paradox. The boxfish is supposedly, somehow, simultaneously the most agile fish on the reef and about as easy to turn as a wheel caught in the cold embrace of a car boot. Both a carousel horse and a bucking bronco. Both a commercial airliner and a fighter jet. The boxfish can’t both require high maneuverability and be permanently turn-averse, but this is what the evidence had curiously shown. The authors of this study decided that a re-evaluation of the boxfish carapace needed to be undertaken. Getting an accurate handle on the fluid-borne forces acting on these fish would require two separate approaches: running algorithm-driven simulations with high-performance computers (a branch of fluid mechanics known as computational fluid dynamics), and the careful collection of data from tests conducted in a flow tank. The latter method didn’t involve submitting actual, living boxfish to a panicked swim in the aquatic equivalent of a wind tunnel. Rather, for their flow tank experiments, the researchers created highly realistic, 3-D–printed models based on laser scan measurements of the carapaces of preserved museum specimens of two species of boxfish (the more rectangular yellow boxfish, Ostracion cubicus, and the more triangular smooth trunkfish, Rhinesomus triqueter) in one of the coolest applications of 3-D printing technology since the advent of 3-D–printed pizza. The research team suspended these models in a flow tank by steel rods and platforms and measured the force exerted against sensors attached to these suspensions. That allowed them to determine just how much drag the boxfish carapace was responsible for, as well as the precise balance of forces acting on the carapace in the water. Using the combination of the flow tank experiments and the computer simulations, the researchers were able to test whether a hydrodynamic quirk of the carapace makes the boxfish straighten up and fly right, so to speak. So, what did they find out? Well, for one, it turns out that the phenomenal, “low-drag boxfish” Mercedes-Benz had chosen as a model isn’t so slick after all. Both species of boxfish produced at least twice as much drag as more conventional, “fish-shaped” fish. In fact, their drag reduction performance was as much as five times lower than the lowest former estimates. Compared with a human swimmer, the boxfish still slices through the water like a champion. But compared with just about every Nemo and Dory on the reef, the boxfish moves more like an armoire clumsily towed behind a boat. The research team also failed to see any evidence that the carapace is adapted to automatically assist in stability. In fact, they observed the opposite. Both the flow tank experiments and simulations showed that boxfish are actually exceedingly unstable in the water and tend to naturally waver, bob, duck, and pitch all over the place while swimming. Rather than self-correction, the carapace seemed to promote spinning along with the direction of the flow. The computer simulations also failed to identify the spiral flows purported to aid in the “vortex lift” thought to bring the boxfish back into a straight path. Based on this, it appears as though the unbalanced, wobbly, tippy boxfish makes for a better spinning top than a car. But how, then, does the boxfish manage to swim at all? Shouldn’t it spend its life helplessly tossed along the currents and swells, tragically bonking into coral heads left and right like an undersea tumbleweed? The answer lies in its tiny, seemingly insignificant fins, particularly those on its tail and its sides. It is likely that boxfish neatly rein in and control their wild topsy-turvyness with deliberate, coordinated, synchronized fin beats. This would provide stability in motion while also encouraging a high degree of maneuverability. Such a system would work like the battery of a propulsion jet that allows an astronaut to move around with extreme precision in the gravity-bereft environment of a spacewalk, tilting and articulating his free-floating body in concert. Previous studies have shown that these fins have a marked influence on locomotion and agility. For example, the boxfish’s hyperflexible tail functions like a rudder, and the fish can swivel around with surprising nimbleness by cranking its tail against its side, inducing a turn of 180 degrees with a near-zero turn radius. * If this ability were incorporated into a bio-inspired vehicle, surely the global population of those who abhor parallel parking as much as I do would cheer their throats sore. A contingent of constant, small, controlled swimming movements allowing for mastery of a radically unstable body would certainly be consistent with the legendary mobility boxfish are known for in the wild. This remarkable swimming behavior is something that is readily observable in the tropical coral reefs these boxfish call home, and it’s something I have personally had the pleasure of watching on many occasions. I live on the island of Oahu, in the lovely state of Hawaii, where as a zoology graduate student studying these bizarre little fish as a part of my doctoral research, I encounter them regularly on the reef. Here, the common flavor of boxfish is the spotted boxfish (Ostracion meleagris), a widespread species found in shallow reefs throughout the tropical Indian and Pacific oceans. 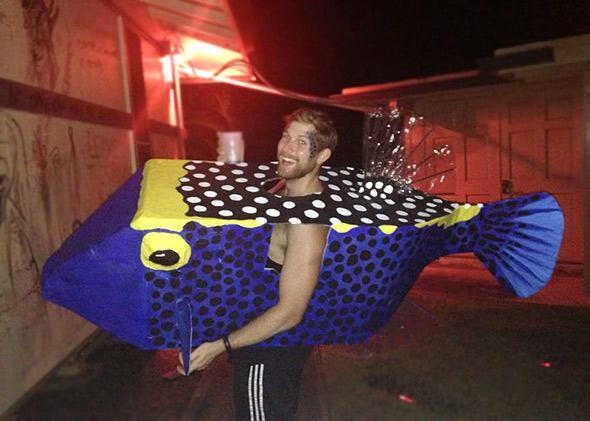 The author as a boxfish. By snorkel, finding them doesn’t take long after submerging your mask in the water, partially because they are plentiful, partially because they congregate in the turbulence of the shallows, and partially because their silhouettes are unmistakable. Almost every single one of the dazzlingly colorful reef fish you encounter in Hawaiian waters flicker and flash along the coral, their sleek, svelte forms twisting and gliding like the dancing of flames and petals in the wind. Every one of them is shaped like a glinting blade or a racing bullet. But not the boxfish, which has the all the grace and countenance of a meatloaf. No, boxfish are shaped like bricks, and for that reason they are easy to spot. The first four-cornered soul to be sighted tends to be a mature male, taking a break from delicately pruning small invertebrates from the rocks and coral, and proudly patrolling his territory in the open, defending his harem of nearby white-speckled females from the advances of rival males. Patrolling males can be seen braving strong surge, motoring stiffly above the reef like a majestic, volant pickup truck. A close approach yields a view of their brilliant coloration, ultramarine blue with black spots on their flanks, golden trim along their top ridges, and black and white-spotted patterns atop their carapaces. But approach too quickly or from behind, and the boxfish will promptly take refuge in the reef. A frenetic sprint provides it some distance, and before you can react, it will throw on the brakes, wheel around a corner as tightly as a drift car on black ice, and plunge under an overhang to hide from human eyes. I have been left in the dust many times, befuddled and bested by the skillful acrobatics of these fish. The story of the boxfish swimming paradox and Mercedes-Benz shouldn’t be seen as a lesson in “looking before you leap” or a condemnation of bionics (which have blossomed in the last decade, inspiring everything from drones to increased wind turbine blade efficiency). Instead, this story illuminates the importance of trade-offs and physical constraints in evolution. Living creatures are beholden to the laws of physics and chemistry, and every evolutionary strategy carries with it unavoidable drawbacks and downstream effects. For example, the bird’s light bones aid in its flight, but they don’t have the load-bearing power of denser, ancestral forms. The evolutionary path of powered flight has led to sacrifices in other capacities. The boxfish swimming paradox was viewed as such essentially because it involved an egregious violation of this concept of tradeoffs, generating a “have your cake and eat it too” scenario of adaptation. The boxfish, supposedly, was a master of stability and maneuverability, even though these skills should come at a direct cost to each other. This vision of boxfish swimming and hydrodynamic aptitudes, despite the attractiveness to the Bionic’s engineering team, was simply too good to be true. In reality, ironically enough, the boxfish has made some of the most dramatic evolutionary trade-offs ever observed among fish, ditching speed and power for a suite of defensive tools and unparalleled agility. These fish are outfitted with bony flak jackets and nasty, toxic skin secretions they can unleash at will and thus have the luxury of swimming slowly and methodically, unlikely to be harassed by anything for too long. This is a curious strategy shared among the boxfish’s closest relatives, the other fish of the order Tetraodontiformes, a branch of the fish family tree including similarly rigid-bodied fish like pufferfish and filefish. As a group, they have evolutionarily abandoned the hallmark characteristics of fish locomotion, cashing in streamlined frames and blinding speed for a menagerie of toxins, spines, inflatable bodies, and armor plating. This collection of oddballs, an innovative and relatively recent offshoot (only about 50 million years old, making them infants in the grand scheme of fish evolution), has embarked on an evolutionary trajectory that appears to provide a fundamentally alternative way of simply “being” a fish. Evolution may have failed to deliver quite what Mercedes-Benz had in mind for its ambitious biomimicry project. But the reality of the hypermaneuverable boxfish is no less remarkable, tailored by natural selection to navigate its mazelike reef surroundings competently. The boxfish does not lament the absence of a course correction mechanism, as its instability is one of its greatest assets on the reef, permitting it to swiftly whirl wherever it pleases, which, much to my aggravation, always seems to be as far away from me as possible. The boxfish carapace may still find utility in bionics, but based on what we now know about its instability, perhaps a better place to start would be with spinning, vomit-soaked amusement park rides. Maybe, one day, Disneyland’s infamous de-lunching tea cups will get an entirely unneeded and undesired boxfish-inspired revamp. Correction, March 11, 2015: This article originally omitted the University of Antwerp when listing the authors’ affiliations in a new study on boxfish. It also originally stated that the boxfish’s turn radius is nearly 180 degrees. It can turn 180 degrees in a near-zero turn radius.